Canada Goose tracks in the mud. A pair of Bald Eagles whimper-chirp to each other as they fly about attended by variable numbers of Ravens. A female-plumage Merganser swims past the end of the pier. Before Teika arrived Fred had been going up and down the steeper shore to my right, finding sparse drift, three metres between the water level and the flood line. 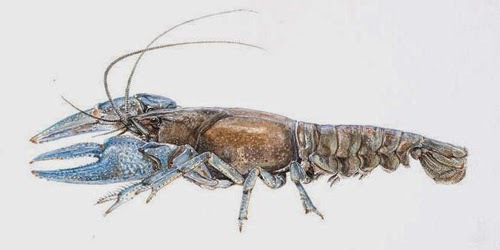 The whole area is scattered with the remains from predators feeding on Rusty Crayfish. Some of the claws are the largest Fred has ever seen. My underpainting this time is dark, purplish indian red, which "pops" the dark colours of the shadowy forest and granite shoreline. I am enjoying the bold shapes and high contrast of this one, but must work fast as Teika has offered to take us to another crossing site. We are 629 metres from where the Transcanada Pipeline crossed the road on our way in. 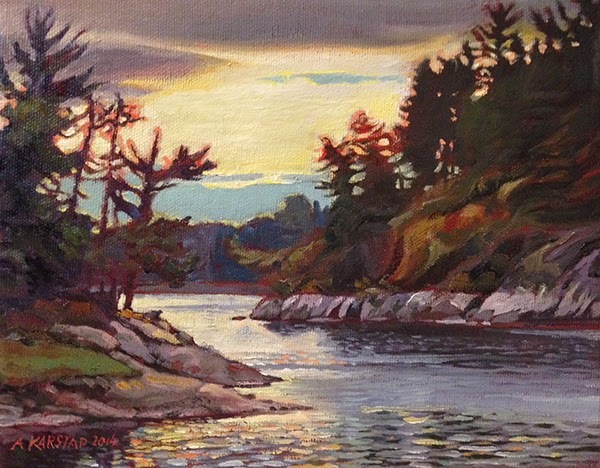 Teika tells me that the view I've chosen for this painting looks toward where the natural gas pipeline goes under the river to Tunnel Island, which carries both the pipeline and the railway!